A new summer camp at Colorado School of Mines hopes to inspire the next generation to think below the surface. Through the support of the University Transportation Center-Underground Transportation Infrastructure (UTC-UTI), Tunnel Camp at Mines welcomed more than 40 local elementary and middle school students to campus in two separate sessions this summer. 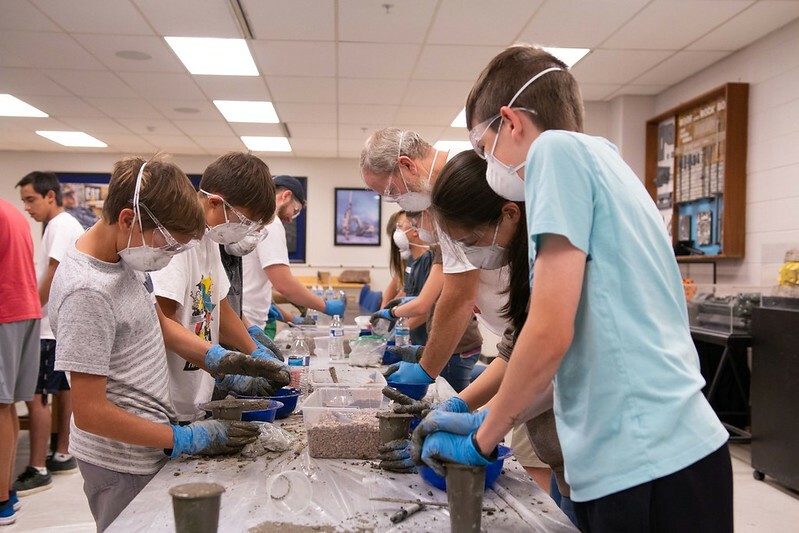 The second session got underway July 30, with five days full of fun, hands-on activities that introduced students to underground construction, geotechnical engineering, construction materials, smart infrastructure and more. As part of the camp experience, students also get to see tunnels in action through a tour of the Eisenhower Tunnel facility on Interstate 70 and Mines’ Edgar Experimental Mine in Idaho Springs. An interdisciplinary group of Mines students helped develop the camp curriculum along with faculty and staff from the Mining Engineering, Geology, and Civil and Environmental Engineering departments. In one activity, campers were in the lab mixing concrete – using their very own recipes – and then forming it into blocks and miniature tunnels. Another activity challenged the campers to build structures out of popsicle sticks that can withstand simulated earthquakes. “We spent quite a long time building popsicle-stick structures ourselves and seeing which ones work and which ones don't and how much glue we should use,” said Noah Ottum, a junior in engineering physics. “It was a lot of glue,” said Paul Tesseo, a junior in civil engineering. Fellow student assistants are studying chemical engineering, metallurgical and materials engineering and geology. Other Mines faculty and staff involved in the camp include Civil and Environmental Engineering Assistant Professor Reza Hedayat and Associate Professor Shiling Pei; Mining Lab Coordinator Bruce Yoshioka; Brent Duncan, manager of the Earth Mechanics Institute; and Priscilla Nelson, professor and head of the Mining Engineering Department and UTC-UTI’s associate director for education, workforce development and diversity. In the future, the hope is that Tunnel Camp could expand to the UTC-UTI’s partner universities, California State University-Los Angeles and Lehigh University, Nelson said. Outreach and education is a core part of the mission of UTC-UTI, which is funded by the U.S. Department of Transportation. The summer camp focuses on a fifth-through-eighth-grade audience but the center also provides training and education on underground infrastructure to state agencies, government and contractors nationwide.